Danii is a great sales agent. She had the qualities we look for honesty, expert in their field and a problem solver. As an out of town client, she took the stress off our shoulders during the sale and at closing. We could not be more happy with the result of our sale. We would recommend Danii and Keller Williams to friends and family. We did a lot of research and found so many great reviews about her and were happy to have selected her to sell our home and help us purchase our new one. We listed our home with another realtor prior and we didn't get anywhere, Danni always stayed in contact with us and we had a full price offer within a few months. If we ever needed to sell our new home our first call would be to Danii. Danii Sedilo did an excellent job of presenting our home, marketing our home, finding a buyer within 12 weeks, and closing the deal. Danii was the second agent who represented our home after they were unable to close the deal and provided horrible service. I felt like I was doing a majority of the work to sell my own home. Danii came in, took ownership of the process, allowed us to sit back and relax while she closed the deal. She is very professional, quick, and efficient. Danii over met our expectations and we walked away very satisfied. I would recommend Danii and her team at Sedilo Group to anyone looking to move into El Paso, or out of the area and allow her to sell your home or get you into a home. Danii, Thank you for a great job on getting my son and daughter-in-law's home sold and closed. This is a huge relief for them so that they can start to set up their home in Virginia. I only wish I had directed them to you in July! I appreciate that your kept me informed through out the transaction. If I have anyone coming to your area, I will certainly call you! Keep me in mind if you have anyone relocating to the Houston area. "As third time home buyers, the process of purchasing a home was not new to us. However, we quickly learned that “house hunting” from the other side of the country (with an extremely tight deadline for travel) was not quite the leisurely adventure we remembered from our previous home buying experiences. Fortunately for us, a close friend connected us to Danii Sedillo, and Danii quickly became our lifeline in El Paso! She spent countless hours calling, texting, and emailing us in South Carolina prior to our 6-day house-hunting trip. She set up a personalized website that provided us with real-time updated MLS listings filtered according to our specific search criteria. Prior to our visit, Danii scheduled nearly two dozen private showings based on our selections, AND she threw in a few surprise showings of her own choosing as she got to know us better. I can honestly say that within a few hours of showings together (after several weeks of long distance prep work! ), Danii was able to find us exactly what we were looking for in El Paso...without ever making us feel pressured. We were truly amazed at the way she got to know our family in such a short time frame, and we were so grateful to have her as our advocate during negotiations with the seller. When we returned to SC, Danii continued to be our eyes and ears in El Paso as she kept us updated on landscaping progress, worked to coordinate all the moving parts of a long-distance real estate closing, and maintained communication with us, the seller, the lender, and the title company every step of the way. I truly can not imagine how one person juggled so much, but I do know that having Danii as our buyers agent was the best decision we made when we relocated to El Paso. I’m convinced that Danii is one of the busiest women in west Texas, and yet she always made us feel like we were her top priority. Not only did she go above and beyond in helping us with our home purchase, but she helped us with everything from hotel and restaurant recommendations to dog boarding, grocery store, and kid-friendly activity suggestions to help ease the stress of a cross-country military move with toddlers and pets. If you are new to the area, do yourself a favor and make Danii your first call. She’ll take it from there!! (And we already know who our listing agent will be when PCS time rolls around again!!)" Thank you, Danii! I also wanted to thank you for assisting Mr. Pocsi. I spoke with him yesterday and he said that you are fantastic and that he would refer anyone coming to the area to you! And we agree! :) We look forward to continuing to work with you on future referrals. I want to personally thank Danii for her professionalism and wealth of knowledge during the selling process of my family’s home. When Danii asked how much I wanted to sell my house for I said $168,000. She took some comps from the neighborhood and told me she could get $173,000 for it. Before we had the house listed she had a list of buyers waiting to purchase it. That first day she got an offer that was $2,000 over asking price and we accepted the offer at $175,000. We just closed today and the entire transaction went over very smoothly and I couldn’t have asked for a better realtor. I highly recommend Danii as a realtor and look forward to sending her quality clients! This past year has been a challenging one dealing with issues of an aging parent. Among the many issues was the clearing out and sale of a long held family homestead. The initial listing was with a local realtor who had other listings close by. They claimed they could get the property sold at top dollar. I signed paperwork and left town. For the next six months I had limited updates, and very little activity on the property. After six months of this and quite a bit of frustration, I decided that when the six month agreement was up, I would be changing realtors. Choosing a realtor from 600 miles away can be a bit of a challenge. I am glad to say it was quite a success. I checked the reviews for realtors located on the West side of El Paso. As I reviewed many options, the Keller Williams Realty Office stood out among the rest. I called their office and described what type of property I wished to list. I was told a realtor would call me back who works with similar properties on a regular basis. About ten minutes later I got a call from Danii Sedillo. I told her that I needed to be able to list the property, but had not been present on site for six months. She assessed the property and was able to give me a complete report of it's current state, as well as what would need to be done to list the property. Due to her assessment we were able to come up with a reasonable asking price that truly helped generate interest in the property. Danii was a lifesaver in managing what needed to be done to the property for me so that we could properly market the property. Once on the market Danii kept me well informed when she had showings, and what feedback she got from potential buyers. After about six weeks on the market we got an offer which eventually became the purchaser of the property. This buyer was challenging throughout the process to say the least.Despite the buyer's difficulties Danii showed complete professionalism, and impeccable character throughout the process. I have truly enjoyed working with Danii throughout the process. I trust her ability to get the job done to the point that I have already referred her to other family members who may need her services in the future. Priscilla and I always get amazed when we encounter someone with my brother's name at a time we feel we need him most. As most know, we recently purchased a home. We had the absolute pleasure working with our realtor Mrs. Danii Sedillo. We went in will little to no knowledge of what was ahead of us, but she kept us well informed of the all the processes. She answered all our questions and if she didn't have an answer (rarely) she went out of her way to get it. She is very stern in making sure her clients are well taken care of and not taken for granted! Thank you so much Danii! We are beyond grateful to be able to enjoy our accomplishments with friends, family, and our guardian angels by our side! Hard work pays off ya'll! P.s If you need a realtor to help sell/buy/rent a home, she is the best! Hands down!!! We can not thank you enough for the quick sale of our house! We were expecting our house to sell within 3 to 4 months. But, instead, it sold within two and a half weeks from the date it was placed on the market! Wow!!!! That was incredible!!! Your professionalism and dedication was only out shined by your enthusiasm which made the selling of our house a reality. For that, we are forever grateful! First time buying a home can be difficult if you do not have the RIGHT person. Danii Sedillo is THAT RIGHT person to have. She explains the whole process, she understands each person’s situation, and she makes you feel comfortable from the beginning. No stress was associated in this process because of her diligent work and dedication to us. She treats you as you are the only one she is working with. My husband was reluctant on buying a house but after discussing our options, we felt this was the best option. We found Danii through a mutual friend. When I first spoke to her, we had a connection. She did not rush me off the phone, she listened to me. She asked many questions especially knowing it was my first time buying a home. I felt that she knew what we wanted in a home. She was so patient from the beginning to the end and even now that we own the home. Danii was able to show my husband properties that I selected and she also offered to show some she knew about that were not listed. She took all the concerns, wants, needs and locations into account. The expectations we had were high but she was able to exceed them. She is very professional and passionate about her job. We cannot thank you enough for assisting us in finding our lovely home. We highly recommend Mrs. Danii Sedillo to anyone. We would do this process again if she is our agent. My name is Jose L. Davila and before I can share my experience in selling my home I would like to express my sincere gratitude for the outstanding and expedited job that Danii Sedillo did in selling my property. I honestly feel blessed to have been referred to her and not only appreciate the expedited sale of my house but the way she carried out the whole process, it could not have been handled any better. On October, 2014 I was faced with the tough decision of accepting a job offer to be able relocate back home to Chicago. Despite the fact that I had just recently purchased a home in El Paso I accepted the offer and began my search for a realtor to put my house on the market. I knew that selling my house would be no easy task given the current market and the fact that I had just recently purchased the home. One of my co-workers suggested that I give Danii Sedillo a call since she had helped out his brother in law. There are no words to describe how blessed I feel to have found Danii Sedillo. From the initial meeting she presented herself with the utmost professionalism and sat down with me and went over the possible scenarios for my specific situation. She said it would be no easy task but she was more than willing to take on the challenge and make it happen!!! I like the fact that she was honest and to the point without hesitation, I felt that my property was in the right hands. I left Texas with the peace of mind and throughout the process she kept me informed of open houses, offers, and showings. We constantly communicated and finally, mid-December we had an offer that Danni was able to negotiate to benefit me the most. I went from being stressed out to complete relief since I did not have to travel back to Texas for the closing. 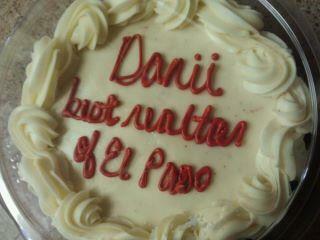 Danii Sedillo understood my situation and took care of everything. Not only did she sell my home fast but she was able to secure the most beneficial deal for my specific situation. For anyone having to relocate and faced with the tough decision of finding an honest, professional, and reliable realtor look no more. For any Military and Law Enforcement personnel in the El Paso area looking to purchase or sell their home Danii Sedillo is the perfect choice. Danii Sedillo has been wonderful to work with. She assisted us while being out of the area. She listened to us, offered many choices and walked us through the whole process. She made buying a home for the first time a seamless process. If you want the best in town, she's the one. We can not thank you enough for all of your help, your advice and your insight. If you need anything else from us (i.e. reference), please let us know. It is our highest hopes you find this testimonial good enough because there were truly no words, we could find, to represent how amazing you really are. The link to your site was not working for us so we've emailed you our post instead; you may find it below. Feel free to use one or both messages at your leisure. Danii Sedillo is an incredibly enthusiastic, attentive and highly-experienced realtor. Prior to my husband and I relocating from Houston to El Paso for work, we decided to purchase a home and enlisted the help of Mrs. Sedillo. Danii educated us on every builder and every neighborhood. She explained every process step-by-step and every contract word-for-word before, during and after each signing. There was never a time we could not reach her and there was never a question she couldn’t answer or find the answer to. In fact, she often called us. Buying a home is said to be a difficult, tedious and stressful undertaking. We can’t say that has been our experience. Danii demonstrated the upmost professionalism, she exceeded our highest expectation and her passion is absolutely reflected in the quality of service she provides. We highly recommend Mrs. Sedillo and would do it all again. Thank you, again, Danii. If you are looking for an real estate agent for El Paso and surroundings, look no further. Danii Sedillo is the to-go person for all your real estate needs, whether you would like to purchase, sell or rent. We are a military family and for our next duty station, which is El Paso, we decided to purchase a home. Since at that time, we lived in Kansas and knew nobody in this area I found Danii Sedillo online. I contacted Danii and right away, I felt like I was in good hands. We spoke several times, I told her our wish list, she sent us several listings and in April we decided to come down to El Paso for a few days house hunting. Danii took the time and showed us so many homes, I can't even remember the exact number. After we found our dream home and started our paperwork, we had to go back to Kansas. While back in Kansas we trusted Danii with everything. She made sure everything was corrected and fixed at the home and was always present on inspections. Even though we were miles away and we did our closing via Fedex, Danii made sure everything was taken care off. We moved to Texas and our keys were waiting for us. This was a pleasant experience purchasing our first home. And even now, whenever I have a question, Danii is always there. She is a true gem and if we ever plan on re-selling or purchasing another home, she will always be my families realtor and I would recommend her to anyone. Not only is she the best in what she does and is on top of everything but she also has a heart of gold. I just finished our testimonial for the realtor who helped us sell our beautiful home and wanted to share it with you. No matter if you sell or buy in El Paso, Danii Sedillo is the best for the job. Please share and spread... the word! If you’re thinking about listing your home and you’re not sure which agent to list with, may I suggest that you list with Danii Sedillo! While it might not seem that the listing agent matters, let me tell you – it does. Not all situations are alike. You may need to sell quickly, you may want to get the highest price even if it takes a bit longer, you might want to do improvements to reduce sales time but aren’t sure what will matter. Trust Danii. It is with pleasure and gratitude that we share comments on our experience with such an excellent agent in the listing and sale of our home. The experience at each phase of the sales effort was superior, such as innovative efforts in developing prospects, useful insights on pre-listing staging, effective contact to potential home buyers and proactive facilitation during the sale negotiations due diligence. All of these tasks, whether business-related or interpersonal, were accomplished with a noticeable degree of competence, humility, integrity and grace. Thus, we highly recommend Danii Sedillo for residential real estate needs. Thank you Danii for making our first home sale such a great experience for all parties. "Danii by far is one of the best Real Estate agents we have every worked with! Since this wasn't our first time purchasing a home, we knew exactly what we wanted. Danii listened to OUR needs, worked with her team, researched homes meeting OUR criteria and she took her time to make sure we saw only the best homes available. Since we were new to the area, her extensive knowledge of the El Paso market helped make our search so much easier. Even after our offer was accepted, she showed us additional homes at our request just to make sure we were getting the best deal and the perfect match for our family. As we were getting closer to closing our deal, we were presented with unrealistic requests from the homeowners. They were not cooperating and trying to delay the process. Danii was on our side 100% of the time. With her sound advice and negotiation skills, we were able to close on our home in a timely manner. We could not be any more grateful to Danii for helping us find the home we love! Thank you so much for your time and efforts! - the Parkers"
Before sharing our experience in selling our home, we want to express our gratitude to Danii for coming to our rescue. Danii is very professional, knowledgeable, honest, trustworthy and a very hard working individual. Along with all those wonderful traits, she is also kind and caring and has a very beautiful personality, which puts Danii above so many other realtors. After marketing our property for a while and with no traffic coming through our home, we were desperate for a solution. We had found our dream home and the only thing between us owning that home was the sale of our current home. With absolutely nothing happening, we found ourselves much closer to not being able to fulfill our dreams of that perfect home and in addition we had no realtor. We lined up several realtors to interview. As soon as we met with Danii (the first realtor) we had to look no further. We immediately knew she was the right person to help us achieve our goal. She understood our frustration and provided us various avenues. Almost immediately traffic starting flowing through our home, she kept us informed of potential buyers and how the market was changing in our neighborhood. We own a ton of gratitude to Danii for selling our home, for listening and for being such an outstanding realtor. Hello everyone hope you all are having a great day. This post is way overdue but I wanted to write it anyway. If you are looking for a REALTOR I highly recommend Danii. We were moving to the El Paso area from Korea and I searched for a long time for a realtor to help us. Our friends in Korea gave us names of realtors to use but none of them ever contacted us back. I found Dani on FB (daniisedillorealestate) and let me tell you she was awesome from day one. She was more than happy to help us and her bubbly personality could be felt all the way to Korea! We talked with Danii over the next six months. During that time she was asking what we were looking for and set us up on her site to look at listings daily. She was such a blessing to us. We came to the El Paso area and met with her. She is so positive and a beautiful person to be around. We found our house the first day! So if you are looking for a rental or a new home she's the realtor you want on your side! My husband and I would like to express our sincere appreciation to DANII SEDILLO for assisting us with selling our home. First and foremost “THANK GOD FOR DANII!” She was more than a realtor to us; she was a part of our Family. She shared the same passion and treated us as if we were her only customers. No matter how busy she was, she always made our needs a priority and followed through with every business step of the way. Danii’s meticulous attention to detail is exactly what allowed our house to sell. Danii keeps her marketing strategies current and she knows what buyers want to see. Her appealing sales techniques such as creating a home book, personalizing her “for sale” sign and advertising on various websites is what keeps her properties hot and new. Danni always answered all of our questions thoroughly no matter how many times we asked. She gave us an update weekly and sometimes daily. Before selecting Danii as our realtor, we originally had another realtor. Our house sat on the market for SIX MONTHS!!! Not a sole came to look at the house nor did anyone even call to ask about the house. Our house was priced too high for our area and our realtor did not take the extra step to help us. We were stressed and luckily a miracle came along, Danii. Our house was on the market for TWO WEEKS and we got an offer, a good one at that! We couldn’t be more happy and pleased with our experience as having Danii as our realtor. She is by-far the #1 realtor in El Paso. No one evens comes close to competing against her she is the best. We thank you Danii and you are most definelty THE BEST REALTOR in El Paso. GREATEST REALTOR IN THE WORLD !!!! My husband and I would like to thank you for your time, energy and passion that you share with us on finding the perfect buyer for our home. The complex process of buying a house with the help of Danii Sedillo has been an absolute pleasure. We first made contact with her months before we arrived in El Paso and Danii was key in ensuring our expectations were realistic and that we were given as much information as possible. From asking general questions about homes, to financing and insurance, she was well versed in all the facets of becoming a homeowner. Danii always made the extra effort in providing details no matter how small they were. After arriving in town, we agreed to meet the following day and after two days and eight homes we found the home we loved and fit just right with our expectations. While signing the contract, Danii displayed her meticulous attention to detail in pointing out several errors that not only benefited us as the buyer but also prevented potential delays in closing. While doing our first walkthrough of the home she pointed out several things that needed attention that we most likely would have missed. During the wait for closing to finally arrive, Danii advised us on insurance, home inspections, and helped us setup the utilities. Upon completion of closing, Danii has always been available for questions and has become much more than a fantastic Realtor but a great friend we have become fond of. There are many Realtors out there looking for your business, Danii Sedillo clearly is what those realtor aspire to be. For anyone needing a REALTOR in El Paso Tx, Danii Sedillo is unquestionably the right choice. She is very knowledgeable and professional. The marketing of our property was very aggressive and first rate in every regard. Our home is in the upper price range for El Paso realty and many similar homes in our gated community have languished on the market for over a year. Bottom line Danii sold our expensive home for a fair price in only four months. We can confidently recommend Danii Sedillo for all your realty needs. She's the best! I want to say THANK YOU to Danii Sedillo she's the best realtor in El Paso and made all this possible for the Gamboa family. Thank You Danii we appreciate what you have done for us tremondously! Hello, it has been a pretty hectiv couple of months with the deployment preparation, wife almost having baby in July, and getting it together here at the house. Wanted to thank you for everything you and Sam did for me, I know it is your job and his, but the customer service and attention was outstanding. I mentioned to some of my friends that Sam did 1000 times more than what my own bank did, he took the time to explain everything and advised on what I needed to do throughout the process. Thank you for recommending him. Danii is not just ANY real estate agent. Danii is REAL. Danii learned about my family and about what we NEEDED and about what we wanted. In the end, she knew MORE about what we needed and wanted than WE did! More importantly, she knew how to get it for us, WHEN we needed it. Danii went WAY above and beyond what I would have EVER expected anyone to do. Our entire family is grateful for her service to us. While she is professional and courteous, she is TOUGH when she needs to be!!! And that was fantastic! It is obvious that she has the respect of her peers, and I have not yet stopped being impressed! THANK YOU, DANII! Danii no es nada mas un agente de bienes raíces. Danii es REAL. Danii ha aprendido sobre mi familia lo que NECESITAMOS y queremos. Por fin, ella sabe MAS que necesitábamos y queríamos NOSOTROS! Más importante aún, ella sabía cómo conseguirlo para nosotros, CUANDO lo necesitábamos. Danii fue mucho más allá de lo que NUNCA habría esperado a nadie a hacer. Toda mi familia esta agradecida por sus servicios para nosotros. Mientras ella es profesional y cortes, ella es FUERTE cuando necesita ser lo!!! Y eso fue fantástico! Es obvio que ella tiene el respeto de sus compañeros, y aún he dejado de estar impresionada! Gracias, Danii! Danii ist nicht nur IRGENDEINE Immobilien Maklerin. Danii ist ECHT. Danii hat über meine Familie gelernt und über das, was wir brauchten, und was wir wollten. Am ende wusste sie MEHR von dem , was wir brauchten und wollten, als wir selbst ! Viel wichtiger ist, sie wusste, was fuer uns das richtige ist , als wir es brauchten. Danii ging WEIT über das hinaus, was ich JEMALS erwartet hätte von jemanden zu tun. Unsere ganze Familie ist dankbar für ihren Dienst . Während sie professionell und höflich ist, ist sie hart, wenn sie sein muss! Und das war fantastisch! Es ist offensichtlich, dass sie den Respekt ihrer Kollegen hat, und ich bin auch immer noch beeindruckt ! DANKE, Danii ! WOW is the best term that comes to mind when I think of what a wonderful realtor Danii Sedillo is. My husband is military and only after a year of being in our brand new built home my husband came down on PCS orders for only a few short months away. We had been through 3 different interviews with local realtors to which all gave us the same answers. That our house would not sell for the price we needed to sell and it may not even rent in time. We knew we would HAVE to bring money to closing because of how new our house was but selling it was the only route we wanted to do. Then one evening Danii came over and was very straight forward and once again we heard that we would not break even we would be bringing money to the table. She was honest and to the point and didn’t treat us like a number in her sales pitch. I felt like she was trying to help us and not make money off of us. WOW was I right only one day after the sign was put into our yard we had an offer. Danii made it happen!!!!!! She did everything she could because she knew how desperate we were to sell the house! There are houses all around us that have been on the market for 8-10 months and ours sold in TWO DAYS! I highly recommend Danii Sedillo to anyone looking for a home and although I have never used her to purchase a home I am sure she is just as wonderful and treats you as a person and not a number! Thank you SO VERY MUCH Danii you will never know what you have done for my family and I! Being a military wife you know that saying when your husband says time to move again, so the search begins on finding the right house for your family, well that’s what happened to us. This happen in June 2011, when stationed at Ft. Huachuca, Arizona, when after a year deployment my husband came home and within two-weeks of returning home we found out that we were getting relocated to Ft. Bliss, Texas within a two-month period. So automatically my husband turns to me and says start looking for another house for us, we have to be at Ft. Bliss in August. I got online and started looking at properties well I knew by looking at so many I knew that I was going to need help, so I kind of j pointed in the right direction and the answer would come. In a couple, of days I was in touch with Danii Sedillo with Stanton Realty, I called her and introduced myself to her and was giving her a list that she could work with even though we did not have a clue about what price range we were working with at the time. But Danii did not give me the song and dance routine as some realtors do but right away she had a game plan on what to do and where to point us in the direction that we needed to go. My family went down in July to meet with Danii and even though we have only spoken to each other on the phone, I felt like I have known her my whole life, she was eager to get us started and we went shopping for homes to call our own, and she stayed right there through the whole process, until the very end. With her understanding and her knowledge of the craft she got the house that we are in right now, without her guidance I would not have been able to do this alone so for that I could not have put out needs in anybody else hands but hers. This is to say what a wonderful job you did and a wonderful experience we had with you while buying our first home. You were very patient with the silly questions i was asking and not once thought i was not smart. If I had to recommend a person to help someone else buy a home it would definatly be you. As a matter of fact I will pass your info to my pastor who is selling his home and looking for one in the city, he currently lives in Horizen city. But a great big THANK YOU for every thing you did to get us into the home right for my family. YOU ARE THE BEST, THANKS AGAIN. --> we had been working together since January 2011... we went through credit repair (with Danii's recommendation) and found the perfect house. Danii, we are really glad that we have you not only as our REALTOR but you have become a wonderful friend, hope to continue in expanding our friendship. We do appreciate everything that you did and all the long hours to make this happen for us. Thank you! My name is Valentina Smith and i want to take a moment to describe how incredible Danii Sedillo was on helping to find the perfect house for us in Ft. Bliss! She was so super good that in only 1 week we found a wonderful Carefree house with all the appliance inside for free!!! So not only we had a super deal, but we also saved $3.000-4.000... I really don't think anyone can beat that!! Thanks to her we also got the living room furniture for a super price!!! She really knows what she is doing and she does it with all her heart and that is what makes the difference! Thank you again Danii for your outstanding job! Having Danii Sedillo as my realtor was the smartest choice I made during my search for a home in El Paso. Her knowledge of builders and quality homes in the area are excellent and she has a true ability to get the home buyer the most for their money. Danii showed endless energy when working for us, when I came to insuring the builder lived up to their obligations and gave us the quality home we deserved. Danii’s expertise in her career made buying a house easy for my Family, she understood what needed to be done and did it. She completed all tasks and worked long hours insuring everything was completed so that I did not need to worry. Having Danii work for me was a great experience and I would recommend her to anyone I know that is thinking of buying a home. I would like to take a moment to give praise to my realtor during my recent home purchase in the El Paso, Texas area. Ms. Danii Sedillo of Stanton Realty, provided my wife and I exceptional service and advice through our home purchase. Ms. Sedillo went beyond what was expected from us and made our transition smooth and efficient. Ms. Sedillo was our voice in the realty community and spoke on our behalf to the manufacturer, realty company, and my mortgage provider. Going beyond our expectations was her calling and we truly appreciate her service and counsel. Ms. Sedillo took her personal time to show my wife and I homes everywhere within the El Paso area covering over 30 square miles from the East to West side and everywhere in between. Additionally she worked through her schedule including providing assistance on Easter Sunday that supported our needs. Words cannot describe her professionalism and commitment to her customers and we are truly thankful to have the opportunity to meet her. If it were not for chance through a fellow military service member, we would not have had the opportunity to create this relationship and use her skills and services; we are truly grateful. Ms. Sedillo has an enormous working knowledge of realty and the military. Being a current service member, Ms. Sedillo was able to translate the military lifestyle and benefits we receive to sound advice when purchasing a home. This unique ability made our home purchase transition effective and worry free. I could not think of another person earning this respect and praise from me and my family. A true professional in every sense of the word. If Ms. Sedillo is not chosen as your realtor during your home purchase in the El Paso area, you are not giving yourself the best opportunity to succeed. She is truly a wonderful and professional lady who earns my highest praise and respect for her service, thank you Danii. I have always been a fan of Coldwell Banker, but recently as my wife and I tried to sell our home in Leavenworth Kansas, I found that I was able to do better on my own. They did nothing to help us out, in fact for four of the six months our home was listed with them it was not even listed in any publications, so we did the "For Sale by Owner" route and sold it in less then 90 days. My wife had a job ready for her when got here, so she asked her new employer to recommend a Real Estate Agent. He gave us three names and we chose the first one because of her military insight. I made contact with Danii Sedillo before we left Kansas and told her what we were looking for and our price range. She stayed in constant contact with us, showing us new and older homes. We met with Danii on the 30th of March 2011 and spent that Friday and Saturday looking at homes. She was awesome! I have never felt so comfortable with home shopping as I did with her. She took the time to explain things that we did not understand, and was also understanding to the fact that we wanted to be in our house as soon as the rest of the family arrived. She was understanding to the fact that I am not a very patient person. Danii was there to the end, and I could not see myself using anybody else. She even provided us with a Homeowner's Tip Guide! I would highly recommend anybody moving to El Paso area to use her, she knows the area well and is a joy to work with. Just wanted to thank you again for spending so much time with us. I think I can speak for Christy as well when I say this was one of the best home shopping experiences that we have had. I am confident that the rest of the process will go as smoothly as it did finding the house. I recently moved to El Paso from Germany and was in a rut. My wife and I decided to rent an apartment prior to actually arriving and found out first hand how bad of an idea that really was. It was only a few days after the move that we decided that buying a home was the best for our family. Enter Danii Sedillo: The VERY FIRST open house my wife and I walked into was being represented by Danii. Having a very short time to make a decision on a house I was very direct with her and ask her to do the same. All I can say is that she was amazing! All of our questions were answered honestly and candidly straight from the beginning. She gave me her card and with a no pressure attitude wished me the best of luck...but I knew I would be back! We went around to a few more open houses, but I was unimpressed with the level of attention and genuine sincerity that I was getting from the other realtors. Within just several hours of meeting Danii, I was already telling other agents that she was representing us. Since we have been with Danii I have constantly felt as though I was her ONLY priority! I sometimes forget that she has other people to take care of. She is always moving in the background taking care of the many loose ends that are involved in buying a house. She calls with updates and never leaves anything to chance. I was never presented with a home that was out of my price range or did not fit my criteria, I love that! She knows an amazing amount about the entire building/buying/selling process and constantly took the time to explain the dozens things that I had never heard of. In all, there is no other realtor in El Paso that I would recommend higher than Danii Sedillo. As far as I am concerned, she treated us like family and she is now a part of mine....Thank You Danii, for everything!! Danii, I want to take this opportunity to thank you for all your patience and help during this exciting experience. Buying a home in El Paso for us was a difficult decision due to the economy and job security issues. Even when you found the perfect property, our situation made us hesitate. However, with your solid advice, excellent network, and willingness to change parameters and start over again, you guided us to finding the perfect property that we can now call home. With your help, the closing process, even with a recent death in the immediate family, was a pleasant and smooth process. We are glad you were a part of our team during this experience, and you will always be a friend to us as you have won our trust and respect. Danii is the greatest, she worked very hard for us, and went out of her way to help us get what we wanted. We came from out of state-- so there was plenty of room for anxiety and other various preoccupations. However, from the moment we met Danii, she was available, efficient, competent, and wonderful to work with. She was very responsive and quick to answer all inquiries. Best of all, she walked us through the process at a speed that was comfortable for us. Being a military family, frequent moves come with the territory. Sometimes we even receive orders to places we really had no desire to move to. When we received orders to move to El Paso, my husband and I were worried about the housing and real estate market. We both had spent the last 14 years in overseas locations and the prospect of having to make a housing decision frightened us a little. We knew that we wanted to buy – on post housing is scarce and rental properties have fluctuating rental costs depending on the demand. The prospect of having more troops at Fort Bliss worried us both in regards to potential rental fee increases. We both decided that we wanted to buy. Through online research we met Danii Sedillo, a realtor who is all too familiar with military life and its challenges. I had a feeling that Danii was “the one” when she said she would clear her calendar on a moment’s notice when I decided to fly in from Europe for a few days to look for a home. Not only did she clear her schedule, she showed me every home I had preselected online knowing full well that I would end up being disappointed. Taking me to every one of these homes made me feel understood, allowing me to come to the same conclusion she had drawn a long time ago without persuading me to forego my internet selections made me appreciate her patience with me. When we finally found the perfect home for our family she guided us through the finance process, intervened when the financing portion was going slower than desired for me (the impatient one). She assisted us in so many ways which I did not expect any realtor to do – selection of appliances, assistance with home inspection, closing, financing, and so much more. I have highly recommended Danii to friends and colleagues. If we decide to sell or purchase another home, this top-notch caring realtor will be our number one choice. Thank you Danii for everything you have done for us. My wife and I met Danii Sedillo at an open house. She immediately was a person easy to talk with and who made us feel she was interested in our housing needs. Danii Sedillo is an excellent Real Estate agent. We could not have asked for a greater sales person than her. She made our first purchase an easy and pleasurable experience. We didn’t know what to expect at all and we were very inexperienced, but Danii made a lot of that easier. She was willing to educate us in the home buying process and took the time to make sure that we understood every detail, not just the broad aspects. She was very knowledgeable and efficient. She was consistently available to answer all of our questions and always went the extra mile to see that we were satisfied. We liked that we could email, call, or text anytime and know that she was on top of our questions, even at late hours. She guided us every step of the way and definitely went beyond her duties. We thought that this whole process was going to be very difficult and tedious because we were not familiar with the home mortgage loan process, but she had it all worked out and we didn’t have to worry about anything. Danii is a wonderful person to work with. We would highly recommend Danii Sedillo to be your choice in Realtors. She is a prime example of what it means to be dedicated to service.